Shoreham top-scorer Rob O'Toole has agreed on a move to Horsham. Shoreham Football Club chairman Stuart Slaney spoke of his relief after his side edged closer to the Ryman League last night. Mussels, who finished second in the Southern Combination League Premier Division, look set to leapfrog Haywards Heath Town, be crowned champions and gain promotion after Heath were handed a nine-point deduction. Haywards Heath were charged by The Football Association earlier this month for fielding a player while under a ‘sine die’ suspension. The matter was then heard by an SCFL committee last night and Haywards Heath have been handed a nine-point deduction, meaning they will finish second and five points behind Shoreham. Heath have 14 days to appeal the decision, which will be heard by The FA but, as it stands, Shoreham will be crowned champions and gain promotion to the Ryman League for the first time in their history. Mussels chairman Slaney outlined a five-year plan to reach Ryman level three years ago and is relieved to be so close now. He said: “I think there is a sense of relief around the club after the decision. “There has been a lot of waiting around, not knowing which division we would be in next season. “Haywards Heath still have the right to appeal, which I’m sure they will, so it’s going to go on a little longer. “The way we are looking at it now is that we are all but a Ryman League team. “I’ve had that ambition for this club for a few years now, so if and when we get there, it will be a proud moment. It has been a busy time for the club, who announced Sammy Donnelly as their new boss last week after Bryan O'Toole stepped down. O’Toole resigned from his position last Monday but the club acted quickly to appoint under-21 coach Donnelly as manager five days later. The 69-year-old has a wealth of experience, managing at both Ryman League and SCFL level and Slaney admitted the decision was a ‘no-brainer’. He said: “Sammy was the first person we thought about after Bryan took the decision to step down. It really was a no-brainer. “He’s got great knowledge and experience at both Ryman League and SCFL level. Shoreham have lost one of last year’s squad already. Top-scorer Rob O’Toole agreed to join Ryman League South side Horsham on Friday. The 26-year-old striker scored 36 times in all competitions last season and will link up with Hornets manager Dominic Di Paola, who he played under at East Preston. 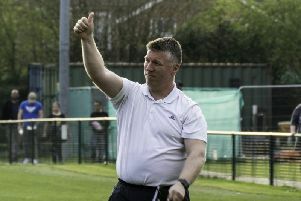 Speaking to www.horsham-fc.co.uk, O'Toole said: “It’ll be great to link up with Dom again.